Control the height and tilt of both your keyboard and monitor with this gas-spring assisted LCD arm. It can be clamped to a tabletop or, to really save desk space, affixed to a wall. With 45 degrees of vertical travel, the gas-spring arm easily raises both the monitor and the keyboard up to about 10". Three hinges allow for significant adjustment in the horizontal plane. 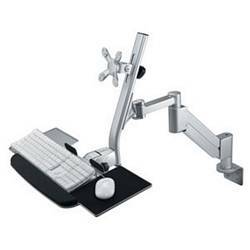 Includes desk clamp, wall mount and mounting hardware. Assembly required. Monitor, keyboard, mouse and cables not included.